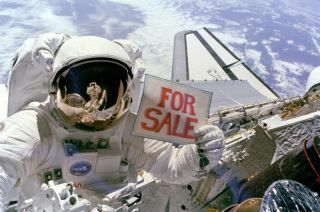 Astronaut Dale Gardner holds up a "For Sale" sign, referring to the two satellites, Palapa B-2 and Westar 6, that they retrieved from orbit. Astronaut Joseph Allen IV is reflected in Gardner's visor. This story was updated at 9 a.m. ET, Feb. 14. NASA scientists and their colleagues are now proposing corporate financing for a human mission to Mars. This raises the prospect that a spaceship named the Microsoft Explorer or the Google Search Engine could one day go down in history as the first spaceship to bring humans to the Red Planet. The proposal suggests that companies could drum up $160 billion for a human mission to Mars and a colony there, rather than having governments fund such a mission with tax dollars. Joel Levine, a senior research scientist at NASA Langley Research Center, was quoted in a release in the Journal of Cosmology by Dr. Rhawn Joseph. The plan covers "every aspect of a journey to the Red Planet — the design of the spacecrafts, medical health and psychological issues, the establishment of a Mars base, colonization, and a revolutionary business proposal to overcome the major budgetary obstacles which have prevented the U.S. from sending astronauts to Mars," said Levine. Money could get raised from the licensing of broadcast rights, clothing, toys, movies, books, games, and so forth. Perhaps even selling the mineral and land rights on Mars could generate money. "The solution is marketing, merchandising, and corporate sponsorships, which is something NASA has never done before," Levine told Joseph for his Journal of Cosmology release. Levine continued, "It's a whole new economic plan for financing a journey to Mars and what will become the greatest adventure in the history of the human race." The plan, which the researchers detail in the book, "The Human Mission to Mars: Colonizing the Red Planet," published last December, and specifically the chapter "Marketing Mars: Financing the Human Mission to Mars and the Colonization of the Red Planet", by Rhawn Joseph, suggests that such a project could add 500,000 U.S. jobs over 10 years, boosting the aerospace industry and manufacturing sector. Joseph also quotes Rudy Schild of the Harvard-Smithsonian Center for Astrophysics, who edited the book along with Levine. Schild said, "A mission to Mars would motivate millions of students to pursue careers in science and technology, thereby providing corporate America with a huge talent pool of tech-savvy young scientists." Schild continued, "Then there are the scientific and technological advances which would directly benefit the American people. Cell phones, GPS devices, and satellite TV owe their existence to the space programs of the 1960s. The technologies which might be invented in support of a human mission to Mars stagger the imagination." "There can be little doubt," Schild told Joseph, "that a human mission to Mars will launch a technological and scientific revolution, create incredible business opportunities for corporate America, the manufacturing sector, and the aerospace industry, and inspire boys and girls across the U.S. to become scientists and engineers." Levine noted the idea of funding a human mission to Mars through corporations and private companies "is a major departure from the way we've done things in space up to now. A lot of things will have to be worked out — NASA in the past has not sold advertising time, television rights and so on." It could be argued that NASA and other government space agencies should spearhead a human mission to Mars instead of corporations because of cost and safety. Astronauts have never set foot on Mars, and like the Apollo missions that sent men to the moon, the mission to Mars would need teams of engineers and other scientists working together over many years, with cost concerns more about staying under a projected budget than earning big profits. Governments also pioneered space travel due to the risky and untested aspects of venturing into such territory. Only after pushing boundaries to make voyages into space safer, more routine and less expensive, could business go where they once feared to tread. "I think it likely most people would find it difficult to conceive there wouldn't be any government involvement in such a mission," said space-law expert Timothy Nelson at New York-based law firm Skadden. "The possession of a rocket alone would probably trip you up on the military regulations that govern the ownership of missile technology in the United States. Not to sound too cynical, but space rockets were built as a byproduct of the arms race." There is no ban on putting ads on the sides of spacecraft or for licensing TV broadcast rights on such missions in the existing law regarding outer space, Nelson added. "The question becomes, economically, whether you can generate enough license fee revenue to pay for what you're trying to do," he said. In addition, "how much can one get exclusive rights to cover something as newsworthy as a human Mars mission?" Nelson asked. "I could imagine other media outlets arguing they had the right to report on it as news. Also, I can't help but think that if only one company in the world had the right to broadcast the mission, that would lead some people to view the mission as a hoax and a conspiracy. There was a movie about that very idea, called 'Capricorn One.' To quell those kinds of doubts, you want to make such a mission as transparent as possible." As to land and other rights, "There's going to have to be an international organization deciding what you can or can't do on Mars," Levine said. "I don't think we can say we can divide up Mars and sell it." Indeed, there is no accepted international system for the licensing of mineral rights on the celestial bodies, including Mars. "There are websites that tell you they can sell you a title deed to a celestial body, but unless there is an internationally recognized and sanctioned system for the utilization of resources in outer space, then you buy or sell those at your own risk," Nelson said. There also may be questions as to whether harnessing the land of Mars could affect the search for extinct or surviving life on the Red Planet. NASA has an office of planetary protection to safeguard against microbes and other types of contamination from being passed around by spacecraft traveling the solar system. NASA and other space agencies abide by a United Nations treaty that governs activities and exploration in outer space, and they comply with planetary protection policies set by the Committee on Space Research. Sending humans to Mars will bring up many questions of the damage they might inadvertently cause. "If you use Antarctica as an example, it was once thought to be a frozen wasteland. When people later took a different view, it resulted in a joint moratorium on mining there," Nelson said. "Even before they took on that view, there was a jointly-agreed system for mining that never took off, which contained strict environmental safeguards. I'm sure if there was any ecological element anywhere on Mars, the greater part of world opinion would favor some kind of regulatory safeguards." To Levine, the cost of sending humans to Mars is the biggest hurdle to overcome. "It's a budget issue, a money issue," Levine said. "Once the money is available, we can do it. A human mission to Mars will be one the greatest adventures in the history of the human race. To me, it's not a question of will we go — it's when we'll go." Still, when it comes to the $160 billion the plan suggests corporations might pony up for such a mission, "where I grew up, that's a lot of money," Nelson quipped. This story was provided to SPACE.com by Astrobiology Magazine. Editor's note: Much of the information in this article was detailed in Chapter XIII.55. of the book "The Human Mission to Mars: Colonizing the Red Planet", "Marketing Mars: Financing the Human Mission to Mars and the Colonization of the Red Planet", by Dr. Rhawn Joseph, Emeritus, Brain Research Laboratory, Northern California.